Aconitum Napellus is commonly known as Aconite or Monkshood, Wolf’s- bane. If cinchona was the “Newton’s apple” of the Homoeopathic discovery, Aconite was the remedy which helped in the rise and progress of Homoeopathy. Hahnemann was able to meet most of the conditions which in his day were treated by blood letting. The generic name derived from “Akone or Akontion” as the plant grows on a stony ground and it is used to poison the arrows to kill wolves. It is found in wet, shady places in mountainous regions at the high altitudes.It is a short acting remedy. Aconite has analgesic, antipyretic, sedative, antineuralgic, antirheumatic, antidiarrhoeic, diaphoretic and diuretic properties. When applied locally, it stimulates the sensory nerves producing tingling followed by depression with numbness and anesthesia. When taken internally causes tingling and numbness of the lips and the mouth, increases the saliva secretion, causes constricted feeling at the fauces, pain in the epigastria, nausea and vomiting. The heart action initially slows down and becomes rapid and weak; the respiration slows and shallows down. It produces anxiety with cold perspiration. · The sudden, acute and violent invasion of disease with fever call for it. 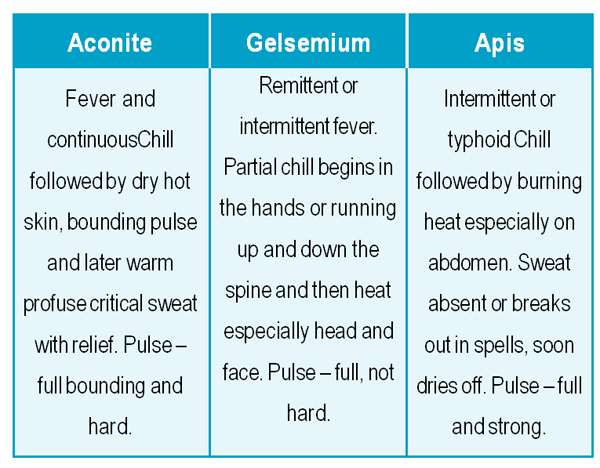 · Serous and muscular tissues affected markedly with internal burning, tingling, coldness and numbness. 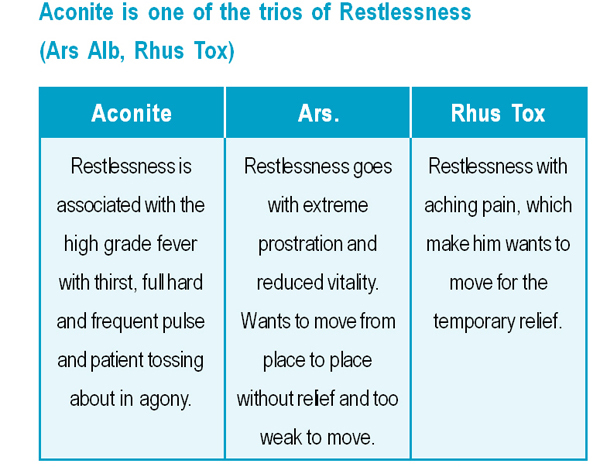 Aconite causes only functional disturbance and no evidence that it can produce tissue changes, so it should not be continued after the pathological changes seen. 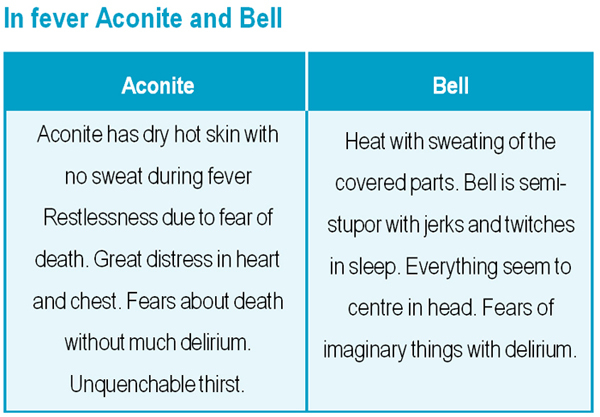 · Aconite individual is strong, plethoric who become suddenly ill but recovery is fast. Like a storm it comes and sweeps over and passes away. · There is active hemorrhage in stout, plethoric people; passes almost pure blood. 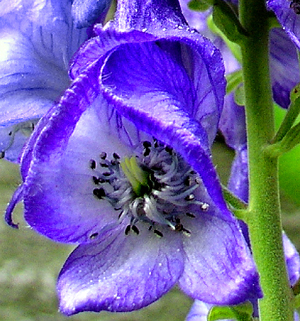 · Sulphur is the chronic of aconite and follows aconite in acute diseases. B Jain publishers (P) Ltd.
5. E.A. Farrington – Clinical Materia medica 4th edition B Jain Publishers (P) Ltd.